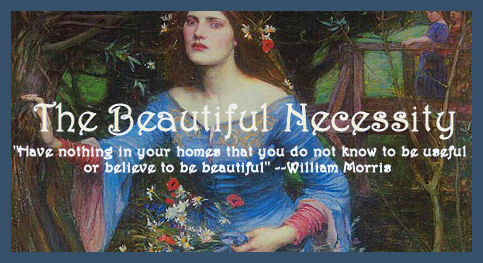 Ahh, after a weekend at home, I'm ready to return for more Pre-Raphaelite lovelies! Today's blog is dedicated to Maggie, the amazing creator of The Costumer's Guide to Movie Costumes, and Lisa, the modern artistic dresser and talent behind Arteffex. Having a keen interest in costumes, as I've already recently mentioned, I get a thrill out of seeing gowns and costumes in movies, and recognizing or being told what art they were inspired by. Below are three of my favorites. Dress 1 was pointed out to me by Lisa, dresses 2 and 3 were discovered on Maggie's site. This first example is my personal favorite. 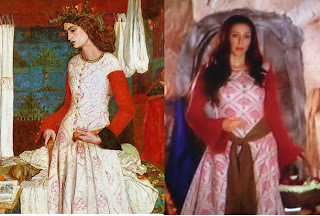 From the movie Snow White: The Fairest of Them All, Snow's mother wears a gown that is a direct duplicate of William Morris' Guinevere, or La Belle Iseult. 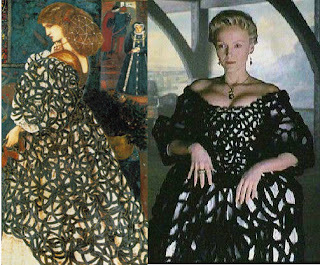 A side by side comparison of the dress from the movie, and the dress from the original painting. 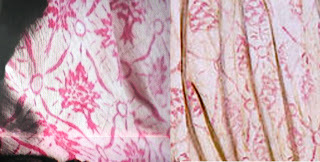 I can't believe they even had the fabric pattern duplicated! The second example is from Perfume: The Story of a Murderer (I love this movie). The absolutely captivating character of Laura wanders her villa garden wearing a lovely robe very reminiscent of Waterhouse's The Soul of the Rose. Finally, the gown worn by Miranda Richardson in Sleepy Hollow could have been inspired by several Pre-Raphaelite artworks of similar gowns, but I personally feel it comes closest to Edward Burne-Jones' Sidonia Von Bork. 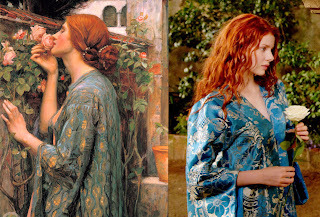 If you see any more examples of gowns used in movies that remind you of Pre-Raphaelite art, please please please let me know! I just love seeing art come alive in three-dimensional ways. Wow, they all look amazing side-by-side and now we'll all be on the lookout even more! I wonder if Miranda's gowns as Queen Mab in Merlin had similar inspirations? Certainly the gowns that Morgan le Fey wears in that movie have a Grecian Goddess look, but nothing I can pinpoint exactly...requires further investigation. Saw Perfume recently, well done in general, good character building, original cinematography... expresses a lot about human nature as well. I'm glad you picked up on that resemblance of the gown from Sleepy Hollow to the Von Bork gown. I thought I was imagining things! I need to see that Snow White film, how gorgeous! The gowns that Titania wears in the Midsummer Night's Dream with Michelle Pfeiffer have some definite Pre-Raphaelite influences. i had noticed Miranda Richardson's gown in Sleepy Hollow also the gown in the fairiest of them all. Crimson Peak has Mia Wasikowska looking like The Bridesmaid of John Everett Millais.